Do you like this pretty little roll cake? I do and was so smitten by the sweet colour of the little roll cake. The recipe was shared by Little Blue, Kristy and Edith. Little Blue made this roll cake without adding in any essence whereas Kristy and Edith added banana essence. Personally, I prefer to have a bit of fragrance from banana essence, not too much though and have also boiled the water with pandan leaves so that the roll cake will not be a powdery taste. 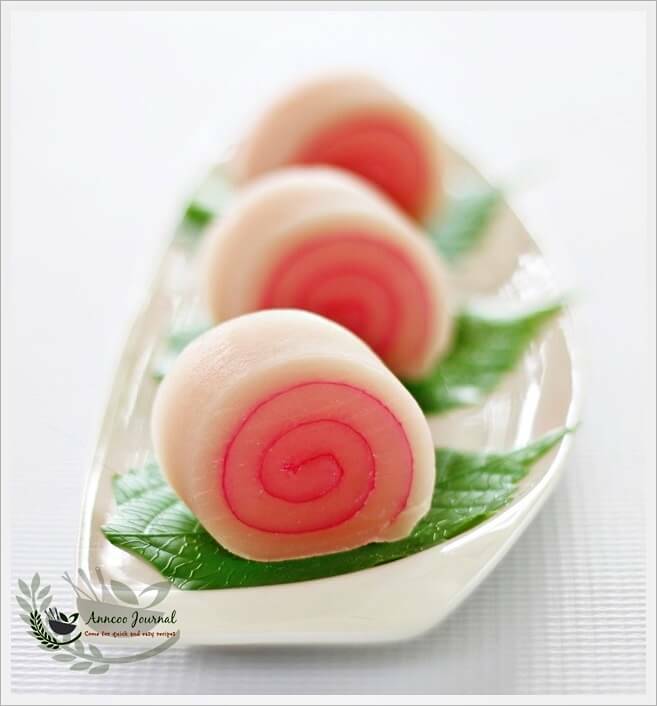 This soft and chewy roll cake is quite easy to make and can be served right away after rolling up. Store them in an airtight container at room temperature and best to consume within 2 days. Sift in flour ingredients into a big bowl and mix well with sugar. Pour 200g water into the dry ingredients, stir to form a thick batter. 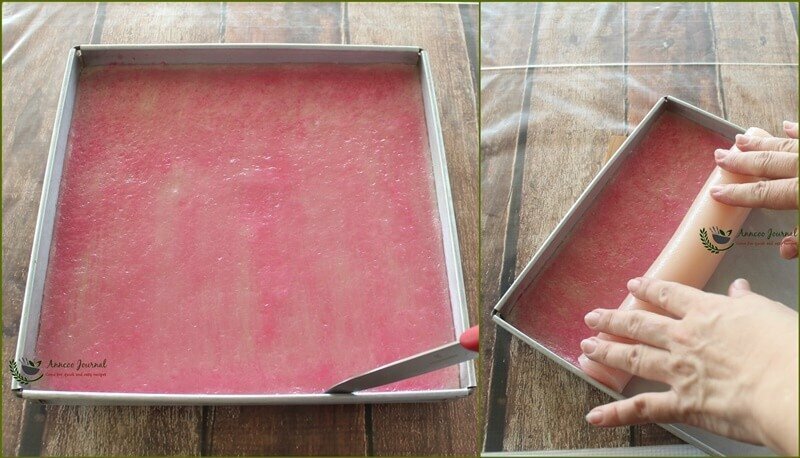 Pour batter to a 9" greased tray (grease with vegetable oil). Steam for 15 minutes. Once removed from steam, immediately brush on the red colouring. Let it sit for 10 mins before rolling it into a cylinder. Remove from pan. Dust the cutting area with toasted glutinous flour, place the cake onto it and give a roll on the flour to coat evenly. Grease knife with little oil and cut to the thickness according to your liking. Hello. Do you have a “non-cook” version of this dessert? Hi Ann, I only have the round metal stainless steel dishes that can fit in my steamer. Can I use these to steam and then roll out the cake to a rectangle shape before brushing on the food colouring? Hi Suzanne, I was wondering how you shape this soft cake from round to rectangle shape 😀 Why don’t you make in a smaller round shape and stack them in 3 layers. sorry i need to ask you a side question… as o cant seem to find your recipe of steam cake and huat kwey.like to check whether you have in your blog? Yes, I have 2 steamed cake recipes – steamed orange cupcakes and sweet potato cupcakes. Please click on the Recipe Index on the top and find under cupcakes/Muffins. Just click on the photos to the recipe. hi can we omit the toasting part? Thanks so much for sharing this recipe; I made this straight away because I have all the ingredient; it turned out to be perfect; I was a long long time that I always wonder how to do it; I stop buying this cake from groceries counter because of the preservative. I did this cake but it is too Q for our liking, please advise which flours should add more or less for less Q texture? Hi, Sorry to hear that. You may add a little more water into the flour mixture. Hi Jin, In HK, they called this banana cake (hiang chiew koh) because they added a lot of banana essence. In SG and M'sia, we usually called soft cake. Yuen koh is round cake, right? I don't think is suitable to use normal flour. Why not try a small portion with normal flour and see how is the result? Wheat flour is use for making 'har gow' skin or kueh kueh. Is called 'deng mee fen' in Cantonese. Thanks for sharing the recipe. I have been looking for the granny's cake recipe to bring back childhood memory but to no avail until I chanced upon your post did I realise this cake is also known as soft cake. I have tried your recipe and modified to my taste preference. Your picture looks really nice. How did you cut your cake so neat and nice? I still need to practise more on the cutting. In fact, I have a family blog (http://kiddohut.com) too, although it isn't a pure cooking blog, I have shared some of my recipes and experiences as well. I have given credit to your recipe in my post. Thank you for trying my recipe. Sorry that I've left out the 'oil' in the recipe last step. Just grease your knife with little oil for easy cutting. Hi Ann! I'm brand new to your blog. I don't have a steamer, any way to recreate a steamer in the oven? Like if I boiled a big pot of water and stuck it on the bottom of the oven with the cake tray on the middle rack and set the temperature to about 250F? Thanks so much for any help! Your photos are beautiful. Hi, You can use your big pot of water over the stove not in the oven. Then place a smaller tray over a wire rack inside the pot of water and steam the cake. I have tried this recipe. Nice!!! I split into two 7" tray. One tray the dough stick onto the tray very difficult to roll up. But the other is fine. Funny right…. Hi Josephine, Did you greased the two trays and pour the batter on both trays at one time? If so, you should have steam one tray first, then grease the 2nd tray and stir the remaining batter and pour just before steaming. thank u for yr advice. How abt i spilt two 7" tray? You can try half recipe with 7" tray. Can i use 8" tray? Can steam but the dough will be quite thick. my childhood kueh!! 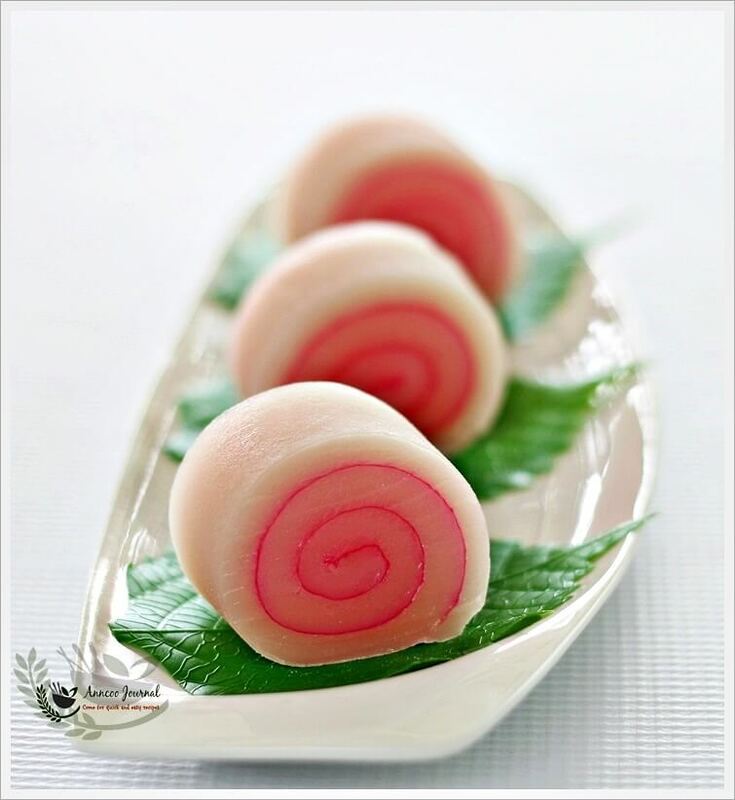 i never know this called steamed soft cake in english..haa.. but iam missing this so much right now….this is so delicious, and look so easy to make, hopefully oneday when i get a complete utensil i can make this. 🙂 thanks for sharing this recipe…finally i found this recipe…..
Hi Lyn, This cake is quite flat and thin.You can try and steam for about 8-10 minutes. The texture is quite chewy and quite different from the very soft like 'mochi'. 13 pan? How long do I need to steam using this pan? Thank you! Wow Ann, this cake looks really good. Sort of like kuih lapis taste, I guess? It's so beautiful too! Now that looks so pretty!! Such a lovely cake! Looks really pretty and yummy! This is so nostalgic to me…such pretty little roll cakes you have made and I love your photography! How cute! And the color is so lovely! Selamat Hari Raya, Ann ! Like every year, I'm celebrating it with my Malay SIL & hubby's family. Hey, thanks so much for the shout out. Your soft cake looks gorgeous. Really pretty ! Hope you're having a lovely day. So pretty! I wish I had a right steamer for this rice cake. You have done it so pretty! Ann, this QQ Cake look so pretty! One of my brother loves this QQ cake, he would be so happy to see this post! Thanks for sharing! 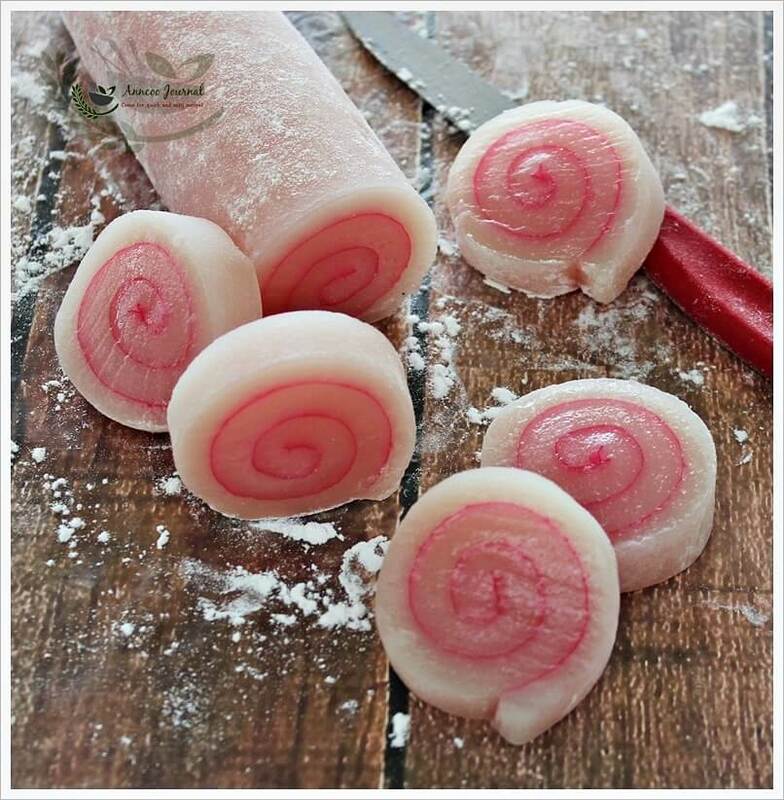 This cake roll is so cute. I love the color and would love to try it. Hi, for e rose pink colouring, is it e same type as those used to coat red eggs? I'm using the liquid type not powder. Can a small bottle from supermarket. Wow, looks so pretty and sweet. Great photo too Ann. Thanks for sharing.